Last week I decided to focus more on some specific things that you need to pay attention for SEO. I’ll try to continue that trend for a little while as I know lots of bloggers are looking to improve their SEO. If there is something specific about SEO or blogging you want to know, let me know and I might be able to cover it in an upcoming post. Previously I talked about different stats you should care about when marketing your blog, but I didn’t delve into user metrics enough. By ‘user metrics’ I am referring to the stats associated with how visitors are interacting with your blog. One of the most important user metrics is bounce rate. Blog Bounce Rates – What Are They and Why Should You Care? Your blog’s bounce rate is simply the percentage of visitors to your blog who only view a single page on your blog and then leave. A lot of times it reflects that people are not finding what they are looking for on your blog or they aren’t interested in digging further into your blog. The higher the percentage, the more people are leaving your blog without viewing multiple pages. One catch is that this also includes people who did find what they wanted, but just didn’t want to see more of your blog. The bounces that you should care about from an SEO standpoint are the ones who return to the search engine results to click on another site. This is what’s called the ‘ping pong rate’. This is usually a sign that the person is still looking for what they wanted. Since it’s a statistic that search engines can easily see, it only makes sense that they would consider it in their rankings algorithms. Unfortunately it’s not something that you can see in your traffic analytics. So instead we have to watch bounce rates as it is closely correlated. In addition to being a SEO factor, you should also care about whether your visitors are satisfied. This is especially true of the first time visitors as it might be your only chance to win them over. Your regular visitors may very well drop by just to read your latest post and be done. If lots of people are bouncing, then you may need to look at improving your overall blog or specific pages. Design First Impressions – Do you feel that your blog design is appealing enough to not scare off visitors? For some niches the design may not matter as much, but an ugly or very unprofessional looking theme could cause first time visitors to lose trust in you, possibly before they even read any of your writing. Ideally your design is as good or better than the other pages showing up in the search results for your target keywords. Consider asking someone you trust as it is easy to be biased about your own blog. Writing Quality – Next ask yourself if your writing quality is suitable for what you are talking about. Would the people searching for your target keywords be comfortable with how casual or how polished your writing is? Could bad grammar or spelling be turning people off? Again, ask a trusted friend for their opinion. Unfortunately this can be the toughest thing to improve on your blog. Page Formatting – How your actual writing looks at a glance can be important too. You might hate to admit it, but some people will not read every word you write. You’ll naturally get some people who want to get to the meat of a topic and just skim through it. This probably happens a lot with the people leaving very brief comments on your blog. So make it easier for them to skim your content. Make use of headings, bullet lists, bold font, etc. You don’t want to just give readers a big long chunk of text to wade through. Distracting Widgets and Plugins – While plugins can be extremely useful, some bloggers get carried away with a very cluttered layout. If you have too many plugins or widgets displayed on your page, it can be too overwhelming for visitors. You can use a lot of plugins or widgets gracefully though. This is more a problem when it is very distracting plugins such as pop ups and animated ads. Slow Loading Time – Today’s internet users have less patience than ever as most are now used to very fast internet connections. Cell phone users may be a little more patient, but if your blog loads slowly on a computer, it usually loads slowly on a phone. So your blog’s loading time is quite important. If your blog is too slow due to a lousy web host, unoptimized images, too many plugins or anything else, you risk losing any visitors that have an impatient side. Unappealing Post Images – I admit that I am disappointed when I see blogs that don’t use an image at all in their posts. Sure their writing may be great, but it’s nice to have some extra color to liven things up and enhance the first impression. While not having images within posts can be subjective, using low quality images can really harm first impressions. With the amount of free stock photos you have no excuse to not at least use some half decent images. Related Posts Plugins – If you look at the bottom of this post, you’ll see obvious links to other related posts on my blog. You might as well make it easy for visitors to find similar content. Some related posts plugins don’t stand out enough and might be a lot less effective. Using one at the end of posts and in your sidebar might increase the chances of deeper interaction. Interlink Posts Within Your Content – While writing your posts, there are bound to be other posts on your blog that you can reference right in the middle of your content. Some bloggers directly mention the post while others just link relevant keywords. Also make sure your links use an obvious font that sets it apart from your regular text. Popular Posts Plugins – Along the same lines as the related posts, but this allows you to highlight your very best content. Some plugins will let you manually choose posts to highlight while others will automatically select what is popular based on views or comments. Using Posts Excerpts On Your Homepage – Some blogs choose to display entire posts on their homepage. While this is actually more user friendly in my opinion, it is also hurting your bounce rates. So go with your gut on that one. Calls to Action – Just interlinking specific posts is great, but you can take it to another level. Directly lead visitors to different posts or pages on your blog, especially at the end of posts. Maybe tell them to also check out a certain post. Or try asking them a question about that other post. Another thing to remember is that your bounce rates can fluctuate a lot from page to page. So dig into your analytics and check the bounce rate for specific pages or maybe even for specific traffic sources. You might find trends with content that is working well or content that seems to be turning off visitors. Maybe your posts are inadvertently targeting keywords which just aren’t relevant for what your post is about. It might be targeting keywords where people are unlikely to be looking for a blog post to read. There isn’t necessarily a magic bounce rate number that you should be aiming for, but you should make an effort to try to improve this kind of user metric. Search engines are likely looking at ping pong rates compared to other pages ranking for your target keywords. So there is probably a sliding scale where different rates are good or bad depending on your competitors metrics. Also don’t just look at bounce rates as the only user metric to watch. Time on site and pages per visit can be quite useful too. Using them in conjunction will give you a much better idea how your visitors are interacting with your blog. Do you actively monitor and try to improve these kinds of metrics on your blog? If so have you had any success with improvement? Im a little torn on this one Jeremy since I have been on both sides of the fence. On the one hand bounce rates could tell you that people stopped on and then left your site but you also have to look at did you have what they were looking for. Say a person wanted to find an answer to a question and your post answered the question. They then leave your site but you gave them exactly what they were looking for. Plus if you don’t have anything else the attract their attention like other posts or links within your posts to keep them onsite they will probably leave. For affiliate sites people tend to like with people land on pages that just have one purpose like to sign up or purchase something. Those bounces are usually higher but convert. If you look at your analytics I would check the amount of time on the page as well. you may have a high bounce rate but they may have stayed and read the entire post and even shared it. In that case the bounce wouldnt be bad. Yeah that’s why I mentioned ping pong rate and checking other user metrics. Bounce rate is far from a perfect metric but it can give you signs that things may not be right. It is best to also be watching other stats, including ad click thru rates as you mentioned. I agree that a high bounce could be bad or good. I check bounce rate and time on site, as well as trying to always have 1-2 internal links in each post. It takes a bit of time but since I have made it a must visits have improved. Good to hear that the focus on internal links has been helping your user metrics. It is time well spent. I check bounce rate all of the time and am currently working on reducing it. What do you think is a good rate to strive for? It really depends on the nature of the page. As Thomas mentioned in his comment above, an affiliate landing page may strive for a high bounce rate. Around 50% is pretty solid for most pages. Over 80% could be a bad sign. Exactly the question I was going to ask. Nice post Jeremy! I do look at these and usually work on a somewhat regular basis to try and improve it. I’ve also got a number of things in mind, towards this end, with regards to my redesign to improve it more. With regards to the related posts plugins, which do you find does better – the ones with just links at the bottom or the kind you have with pictures? I haven’t done any testing to confirm whether the ones with images are better, but I do like the splash of color this one gives at the bottom of my posts. It is probably a lot more eye catching. With the text based plugins you can link to more pages though. So it might depend on how many other related posts you have for each topic. Glad to see you mention Ping Pong rate, because bouncing is not always a bad thing and most people don’t realize that. I run a coupon/deals website and that has a high bounce rate because people come, get their coupon and then leave. Exactly, a page like that would most definitely be doing its job well when the bounce rate is high. That is why search engines need a sliding scale to judge each keyword differently. My bounce rate is terrible. But I have tons of clicks on my related posts plugin. Might be slow load times or something, not sure. I’ll dive into the metrics a bit deeper. Thanks for explaining this stuff. I’d also look at your percentage of first time vs previous visitors. If it’s a lot of return visits, the high bounce rate would be normal. Good call. I’ll check into that. Thanks Jeremy. You can also test your suggestions on your bounce rate. Google analytics has a tool called “content experiments” that will help you test and find what suggestions work better for your unique site. Good call Mark. I actually didn’t know about that but it sounds like a good resource to use. You always want to try testing things to see how it compares to previous trends. Thanks for diving into this stuff. SEO and Bounce Rates are new concepts for me, so this series of entries is right up my alley. No problem. Check out the rest of the posts in this series for similar tips. It’s funny you should bring up site design in this post, as we are looking at reskinning one of our sites again! I do think having a sharp look that really fits your niche brings validity, which I think keeps people on the site a little while longer. I know when I see crappy looking theme, and crappy images, it lowers a site’s credibility in my mind and I am more likely to leave quickly. I had yet to hear that bounce rates have an impact on PR though! No it doesn’t affect PR…as far as I know. Don’t mix up PR and search engine rankings. They are 2 different things. A lot of what you can do to improve your PR also helps your search engine rankings, but not everything that helps your search engine rankings helps your PR. Good topic and something I often try to improve. I wish it was easier to know up front what would and won’t turn people away. Before I had a blog and just read lots of them, I did like it when blogs have the related articles at the bottom of the post if I enjoyed the content. If it’s just crap, I guess it doesn’t matter whether you use that or not. lol that is true…all the best plugins won’t save crap content. It would make things a lot easier if things were more black and white about how to keep visitors on your blog. The problem is that blogs have unique demographics that tend to react differently to how your blog is setup. This stuff is all very new to me but it totally makes sense and I see now why people do put all these things in their posts. I will definitely start following as many of these suggestions as I can. Thanks for posting this! Yeah it is pretty logical…at least for the user experience. Not everything Google does is logical though. I am leading by example on some of these things, but there are definitely things I could do better. My bounce rates aren’t exactly anything to write home about. I have to agree that excerpts for short posts is less than ideal. Thanks for explaining this to us mate. I don’t know how to tell bounce rate with the free wordpress but I imagine once I move I may learn more about it. I love it when you share tips, Jeremy. These are great! I have a plugin that shows similar posts, and it’s helped with the bounce rate a lot! Well in that case I will try to keep them coming for a while more still. It does seem to be getting close to the end of this series though. One of these days I might have to make this a full finance blog. I found my bounce rate improved just by reducing the size of the images on some of the pages. Some images were so large that it was really dragging the load time and I didn’t realize it. Also, like you say, adding a link at the end of the article or withing the article so that the reader can choose to continue on to another part of the site makes a difference, too. That is actually a pretty common problem with new blogs. They find great photos to use, but they don’t know that they should be optimizing those photos for better filesize. I’ve heard that if you have a high subscription list, you’ll get higher bounce rates as subscribers can come and read the day’s post and then leave. I’m always happier to see lower bounce rates, but I suppose I take them with a small grain of salt. That is definitely true. Usually a subscriber has dug into your blog previously and now only cares about new content. That is why you should be also looking at the differences in stats for new and returning visitors. But from the point of view of user value, bounce rate is extremely important. Related posts and interlinking do a good job here, so these two are must dos! My bounce-rate is in the mid 80s. Considering some of the search terms I see for people reaching my site, I’m not surprised at all. The way I see it, almost all of search visitors are looking to have an question answered. If the post they find doesn’t answer their question, they are going to “ping-pong.” And I don’t blame them. I blame Google for ranking me for a rediculous keyword. If the post they find DOES answer their question, that isn’t going to help my bounce rate either. Because they are probably looking for just that one item, not to find a brand new blog on the topic. My top 2 posts drive nearly a third of my traffic. And search visitors get to them through variations of asking the same question: how do I do X. Once they know how to perform X, they have gotten everything they need from me. Even worse, one of the posts is rather detailed and not something that most people can take care of in a single day. In that case, they are probably going to bookmark the page and then have several bounces to the same page. Good points Edward. 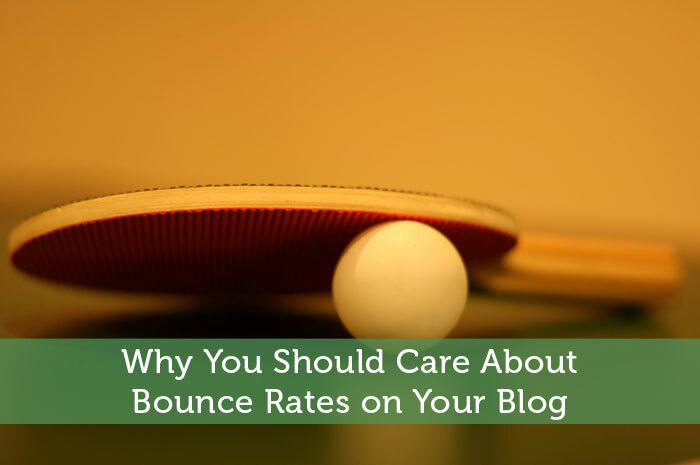 It is true that the bounce rate is far from a perfect metric. So it’s not something that should be focused on independently of other stats. That being said, we should still be making an effort to get people digging into our site even if we are able to satisfy their original query. Enticing related post titles or featured posts could do the trick. Never heard about this part of SEO. So thank you for all the tips. No problem. There are all kinds of technical details of SEO that beginners might not know about yet. This is very timely because I was just looking up my bounce rates yesterday and I realized it was high because I used to have all posts on my first page. I fixed that and now its better but I might switch to another theme where I only show part of the first post. Thanks for the idea. Yes that kind of change will improve your bounce rates. Still you might want to poll your visitors to see what they prefer. It feels like you wrote this post just for me. As you know, I’m dealing with crazy bounce rates that may have affected my search presence. But, thanks to your advice, I’m also going through a redesign that should fix a lot of the problem. That being said, thanks for all the advice. You’re the blog savior! Remember that bounce rates might be a warning sign, but it’s not always the case. If those people are still staying on your blog long enough, they might be getting what they want. You can always check which page people were landing on for certain keywords and asking yourself whether that page truly satisfies what those people would likely be looking for. Great post, I feel anybody can use these tips to improve. Thanks I will consider some of these and carve out some time and money to fix some of the things on my blog. Yup these kinds of tips aren’t just limited to finance bloggers and not just a certain level blogger. It’s the kind of thing you should be constantly addressing despite what stage of the game you’re at. I am always interested in all of the stats on my blog, and making them better. Bounce rates included! It is important to keep your eye on all those stats if you really want to improve your blog and keep it growing. Great post Jeremy really appreciate you sharing this information. I just checked my bounce rate on Google Analytics and it was 0.62%. I assume that pretty good? That would be phenomenal, but also pretty much impossible. The only time you’ll see below 1% like that is when you somehow have analytics code inserted into your pages more than once. I assume you have it inserted via a plugin and manually inserted in your theme’s footer. Or it could be in 2 separate plugins. It is likely skewing your other stats too. Thanks for the tip Jeremy – I often visit my favourite blogs multiple times per day just to see if they have updated with new content. This probably throws out the bounce rate for homepages (I’m assuming I’m not the only person who does this) so perhaps focusing on article bouncerate is more useful? That is very true which is why you should isolate first time visitors if you can. If their bounce rates are bad, then it is more of a problem. Article bounce rates may be a little more important than homepage bounce rates, but you’d still get repeat visitors who click a link via social media or their rss reader. Thanks for getting me thinking about my bounce rates. They are a bit high on my site, but at the same time, I believe that many readers may just be returning visitors and coming in to check out my latest post, then leaving. I do the same on a lot of the blogs I frequent. But, on the other hand, you likely have a point that a significant percentage of the bounces are not a good thing. If you use Google Analytics you should be able to narrow your stats down to just the first time visitors. This would validate your theory and give you a more accurate depiction. My posts cover the spectrum of 25% – 85%. I guess I need to look at the higher bounce rate pages to analyze and determine what is going wrong with those ones. Also, I have a goal to improve on my call to action. That can help get people more engaged. Any pages that are as low as 25% are doing awesome, but 85% is rather high. So do take the time to look into it further to see if you can pinpoint any problems.